So what are this year’s Top Five Inflatable Hot Tubs? Well, every year we see a flood of inflatable hot tubs onto the market. Some of these are upgrades or re-brands by established hot tub manufacturers. Others are brand-new models by companies who are new to the market. Many of these models don’t really add anything to the hot tubs they hope to compete with. But occasionally one breaks through and turns the inflatable hot tub market on its head. It could be a new shape or design, a new internal construction, or a new massage system. Spending your hard earned dollars on one of these new portable spas can be a disappointment if you don’t do your research. That’s where we come in. We have researched, checked out, and worked our way through hundreds of different models, taking in the rough with the smooth. From there, we create the reviews on this site, simply to help you make the best choice. And so, culled from our own long list of the best inflatable hot tubs, we present this year’s Top Five Inflatable Hot Tubs. We truly hope they help you make a great choice. This is the best Budget model by far. As well as its sturdy design and great comfort, it also has a bucket load of outstanding features. But the real winner, hands-down, is the internal LED light show that comes as part of the package. You get to choose from 7 colors to suit your mood, or you can have it cycle through all 7 lights for a great light display. We love it. When you’re buying a luxury inflatable hot tub, you want it to look amazing and perform out-of-this-world. This model certainly does all that. 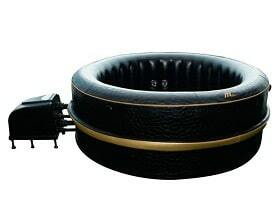 It has an elegant look to it, with its black and gold design. But for us it’s the 8 adjustable massage jets, straight out of a traditional hard-shell hot tub that really blew us away. An incredible hot tub, and a real trailblazer. 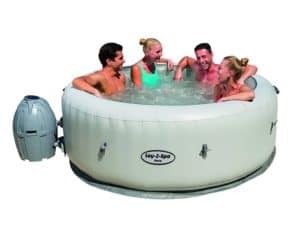 This amazing 5 person hot tub is definitely a portable spa, and not an inflatable hot tub. 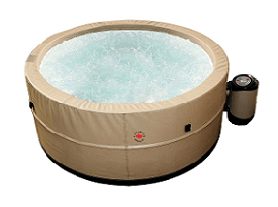 It has 5-inch thick walls that slot together to make a round hot tub that is the deepest and most heat-efficient on the market. This innovative construction makes it feel more like a traditional hot tub. Add in the powerful massage system, and the hydro-massage seats that come as part of the package, and you have an awesome spa. 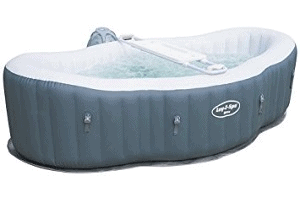 This 2-person inflatable hot tub has a great design that is perfect for two. It’s long in shape, so you can each sit, one at either end. But it’s also wide enough for you to cuddle up close and enjoy a romantic soak and massage together. It also comes with a drinks tray included in the price, so you can enjoy a drink and some snacks as you luxuriate together. 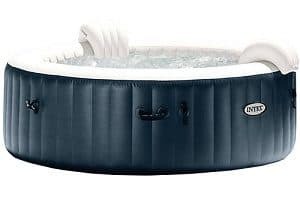 For a Budget-priced inflatable hot tub that’s big enough for 4 adults and a couple of kids, and has a super-powerful massage system, this model wins hands down. Throw in the built-in hard water treatment system, 2 cushioned head rests, and the insulated lockable lid, as well as a range of other extras, and you get one of the best deals money can buy.